Please find some pointers on finding supplies (in Adelaide especially) here. How to patch your jeans (and any similar non-stretch garment that needs a big patch). Colour scheme, shape of patch and kneeling in the garden, all optional. How to mend threadbare clothing (I know, it looks like embroidery but it is mending). There are videos on making ‘cordage’ on YouTube. Many start with a whole lot of steps about stripping bark, which is only one possibility in terms of materials to use. The process of actually twisting fibre into string is the same whether your use bark, bast fibre, leaves or fabric strips, really. If you can find suitable materials (I use daylily and cordyline leaves mostly)–you need to start with dried leaves. I use those that have died as long as they have not started to break down. This may not be optimal practice but it works. Soak them long enough to make them supple. Tough leaves like cordyline might need overnight in a bucket, but an hour will do it for daylily, or you can dunk the leaves in water and wrap in a wet towel overnight. Then tear into strips lengthways and begin the twisting process. You can find the process explained in every basic book on basketry techniques. I am using a technique like the one in figures 4a and 4b on this site. The link shows three ways to create string by hand, all of which have been in use by humans for a very, very long time. In a short video here you can see Jude Hill using the same technique to create a thread fringe on a piece of patchwork. Enjoy! Follow the link to my tutorial. Would you like to know more about eco-printing/leaf printing? The originator of this technique is India Flint and you can find information about her techniques and her books, which are gorgeous… as well as her current work, at her blog. Her books Eco Colour and The Bundle Book are the primary sources on eco printing as well as being beautiful and inspiring. The Bundle Book explains how to eco-print on paper, while earlier works focus on fabrics. Two articles in Turkey Red Journal may interest you: one about India Flint by Ilsa Perse; and another by India Flint about her work. Mordanting is the process of pre-treating textiles or fibres so that they will bind with dyes. Some combinations of dyestuff and textile require a mordant in order to make sure the dye can bind to the textile. Others do not. Books on natural dyeing offer lots of detail on this question. One excellent treatment is in Jenny Dean’s book Wild Colour. Like many natural dyers today she is working on non toxic or low toxic methods, does not use carcinogenic and poisonous substances for this process, and her instructions are very clear. Her blog is beautiful and informative, too. Another excellent recent source is Rebecca Burgess’ book Harvesting Color. Would you like to know how to mordant cellulosic fibres (cotton, linen, hemp) with soymilk? India Flint provides a detailed set of instructions in Eco Colour. My post on this subject sets out the process I use. Other people (such as India Flint and Jenny Dean) do many different things and you can find out how they proceed by consulting their work. There is an article which describes multiple ways of mordanting cellulose fibres in Turkey Red Journal called ‘How to Mordant Cotton–Let me Count the Ways’ by Donna Brown, Diane de Souza and Catharine Ellis. To the best of my knowledge, black bean dyeing has been unvented and refined through collaborative experimentation by many dyers. I have found this conversation online on Ravelry. Ravelry is free and well worth signing up for–it is directed primarily at knitters and crocheters but there are plenty of spinners and natural dyers there too. 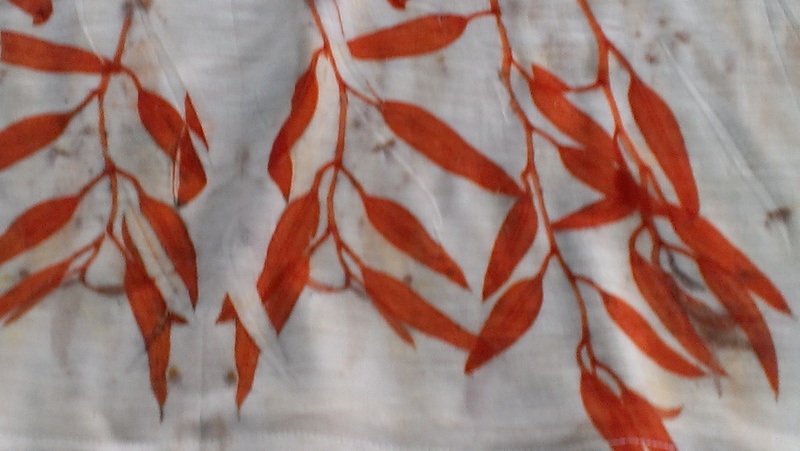 The Plants to Dye For forum is full of ingenious experimenters reporting their findings and there is an extensive discussion of black bean dyeing. This online forum on Ravelry will also be of interest to people outside our region dyeing with plants that are native to Australia and Aotearoa–which grow in other parts of the world as weeds or introduced species. Feel free to come and join us. You are more than welcome. Thanks for sharing so much information and inspiration. Hi could you please also spread the word and get behind a page on facebook called save our trees in goodwood. I love seeng all the wonderful results! Is there anyone who can send me some ‘fallen’ cinera leaves? 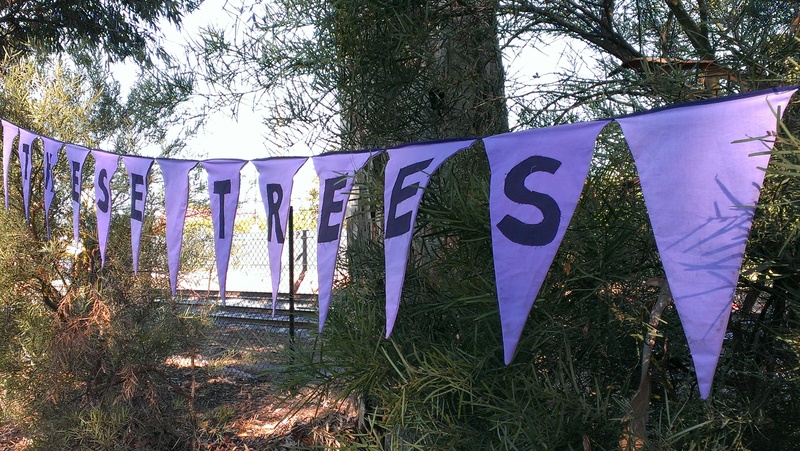 I haven’t been able to locate any in Cairns…I think they are a more ‘dry’ climate tree?? I think that E Cinerea is from Tasmania, so certainly a cool climate tree. I would send you some Seva, if I was sure it was legal and not a disease risk to do so. But keep experimenting with the trees you have–there are sure to be some that give great colour! I get pink on linen sometimes but quite a strong orange most of the time. The result will vary with season and weather and water. Your words and your activities are an inspiration……so much so that I am finding the need to make string after seeing you twisting so many materials into lovely lengths. Perhaps you could give a brief tutorial on string making for the textile illiterates like me when you have time. I would be grateful! Thanks again for your gorgeous pictures and thoughts. Thanks so much, Fiona! I haven’t quite managed the art of making a video… and I think this is what would be needed to show string making (either that, or I need to be able to draw a whole lot better than I can!) There are videos on making ‘cordage’ on YouTube. Many start with a whole lot of steps about stripping bark, which is only one possibility in terms of materials to use. The process of actually twisting fibre into string is the same whether your use bark, bast fibre, leaves or fabric strips, really. If you can find suitable materials (I use daylily leaves mostly)–you need to start with dried leaves. I use those that have died as long as they have not started to break down. Soak them long enough to make them supple. Tough leaves like cordyline might need overnight in a bucket, but an hour will do it for daylily, or you can dunk the leaves in water and wrap in a wet towel overnight. Then tear into strips lengthways and begin the twisting process. You can find the process explained in every basic book on basketry techniques. I am using a technique like the one in figures 4a and 4b on this site.